In the months leading up to Apple's Worldwide Developers Conference each year, the company offers free WWDC scholarships to students and STEM organization members who don't have the $1,599 necessary to purchase a ticket to the event. When selected, the scholarship winners gain a free WWDC ticket, free lodging, and a free one year Apple developer membership. 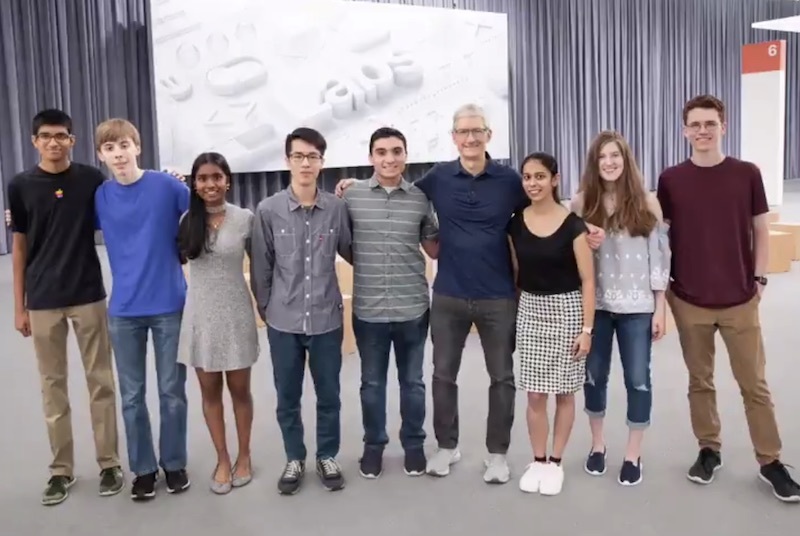 On Twitter today, Apple CEO Tim Cook celebrated these 350+ individuals with a quick video highlighting a few of the winners and their apps. In the video, Cook is seen discussing the apps with the scholarship winners, who also briefly describe the projects they're working on. Some apps include "Study Buddy Connection," which aims to streamline how tutors and students find one another, and "UV Safe," which sends out iOS notifications to apply sunscreen based on the UV index at your location. Accompanying the video, Cook's tweet says: "Nothing inspires us more than fresh ideas." WWDC 2018 kicks off tomorrow with a keynote at 10:00 a.m. Pacific Time at the McEnery Convention Center in San Jose, California. As developers and other attendees arrived in California over the weekend, the first glimpses of conference swag appeared online, including a Levi's denim jacket and a collection of Apple-themed enamel pins. MacRumors will be providing all of the usual coverage of the conference, with real-time keynote updates found on our @MacRumorsLive Twitter account and all of the event highlights appearing on MacRumors.com throughout the day and week. In preparation for the keynote, visit our full How To guide on the best ways to watch the presentation live on June 4. Wish they had stuff like this when I was a kid/teen. Instead I would have people tell me I was weird, that I had no life and that I needed to go outside more even though I was tan and had a girlfriend. I got to design one app at work but working with the external dev team was awful—even after switching devs—to the point where I had to start learning Objective C to patch remaining issues. I’m still a complete noob though and wish I had not wasted the summer of 2008 in college trying to find a summer job in a horrible imploding economy. A better idea would have been spending the summer learning iPhone dev and make some of my ideas into apps that were later made by other people. But at the time I had a lot of debt and needed cash immediately. Ended up not finding a job because of all the older adults flooding the market. Definitely a low point in my life that I wish I could do over. Also started dating my wife during this time so it’s amazing she stuck with me, lol. So it wasn’t all bad I guess. Sorry to go off-topic but I love sharing my passions. I know how that feels. But then I remember that most of the people that tell me that don’t have many hobbies and complain that they are bored a lot of times. As the saying goes, “if you’re bored you’re boring”.